Besides economic potential, Tampines also offers a vibrant selection of leisure and lifestyle pursuits. With over a quarter of a million residents, Tampines is one of the most popular and populous residential estates on our tiny island. While HDB flats make up the bulk of the planning area, there is a growing cluster of condos in Tampines, particularly along Tampines Avenue 10, near Tampines MRT station, and Tampines West MRT station (which started service in October 2017). The revival of suburban localities, the establishment of new growth corridors, and new MRT lines in the region has clearly catapulted demand for properties in the area, and this can be observed in the rising prices and transactions in both the new sale and resale segments. 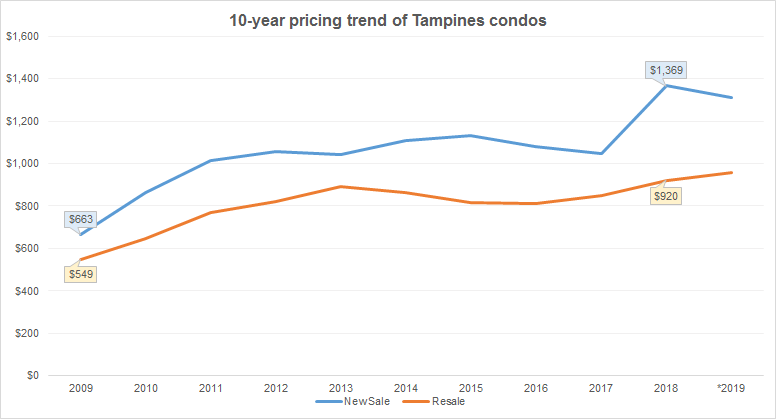 Between 2009 and 2018, transacted prices of new sale condos increased by over 106%, from an average of $663psf to $1,369 psf. The same can be observed in the resale segment, in which prices saw a 68% increase over the last 10 years. 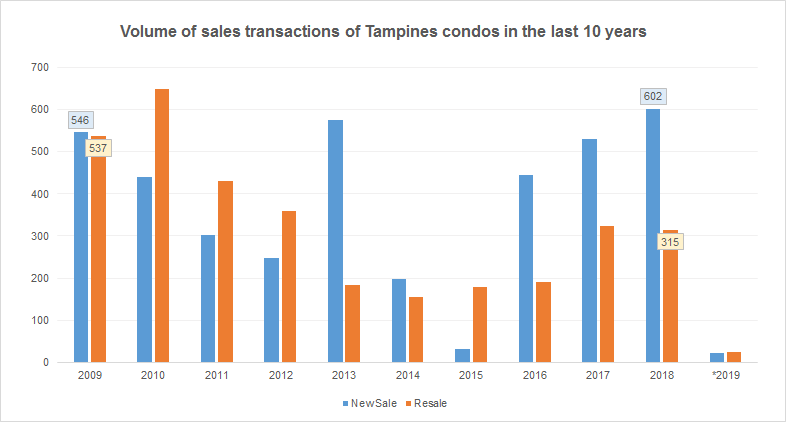 Volume of sales transactions of non-landed private residential properties in Tampines has also been on a consistent uptrend in recent times. This is also observed in both new sale and resale segments. Having been planned and developed as a Regional Centre since the 1990s, Tampines has matured into a bustling commuter town for those working in nearby Changi Business Park, Changi Airport and the SUTD (Singapore University of Technology and Design). 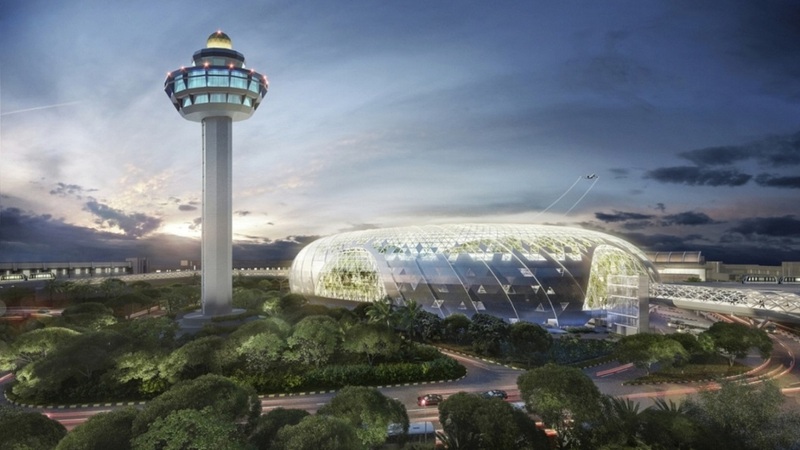 More job opportunities will be created when Jewel Changi Airport opens in 2019. Besides economic potential, Tampines also offers a vibrant selection of leisure and lifestyle pursuits. For instance, residents now have access to various sporting facilities, event venues, retail outlets, and health centres with the opening of Our Tampines Hub, an integrated community and lifestyle building. For outdoor lovers, there is Tampines Eco Green, a park designed to showcase different natural habitats like wetlands and rainforests. Park connectors link it to Sun Plaza Park, Bedok Reservoir Park, and Tampines Quarry Park. Being a mature estate, it also boasts a host of amenities, schools, ample shopping malls and supermarkets like YES and NTUC FairPrice. This makes Tampines one of the most vibrant estates in the East, says Christine Sun, head of research and consultancy at OrangeTee & Tie. Recent additions to the MRT network has made travel easier and more convenient than ever for residents in Tampines. For instance, present and future MRT lines—the Downtown Line (DTL), the Thomson-East Coast Line (TEL), and the Cross Island Line (CRL)—will ensure that the majority of East Region residents will have access to MRT stations within walking distance from their homes. Homes located near MRT stations tend to be particularly attractive amongst property investors, as they typically command higher rental rates. Such developments will no doubt continue to appeal to investors seeking a value buy with a ready catchment of potential tenants, and it is for this reason that properties in Tampines will continue to see a pricing uptrend in years to come.